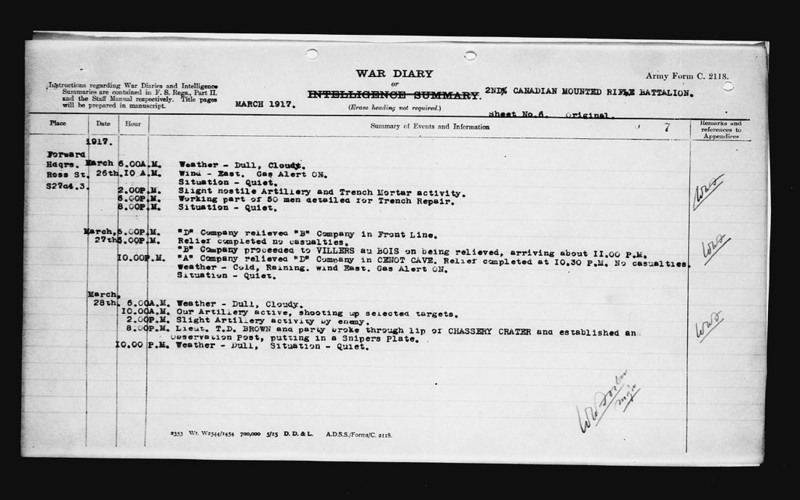 Fri., Mar 30, 1917 Forward Hdqrs. Ross St. S27d4.3. 6.00 A.M. Weather – Clear. Situation – Quiet. Wind East. 8.00 A.M. A practice Barrage was carried out at 8.00 A.M. on enemy Front Line and Support Systems. 10.00A.M. Enemy Artillery and Trench Mortars active. 4.00P.M. Our Artillery active, shooting up selected targets. Wind, EAST Gas Alert ON. Thu., Mar 29, 1917 Forward Hdqrs. Ross St. S27d4.3. 8.00A.M. Weather – Clear. Situation – Quiet. 10.00A.M. Slight hostile Artillery and Trench Mortar Activity. 2.00 P.M. Our Artillery active, shooting up selected Targets. 6.00 P.M. Situation – Quiet, Wind East, Gas Alert ON. 12.30 A.M Lieut. Douglas, with party of Bombers, carried out, and placed under the German Wire, on NORTH and SOUTH side of CHASSERY CRATER, 2 BANGALORE Torpedoes. 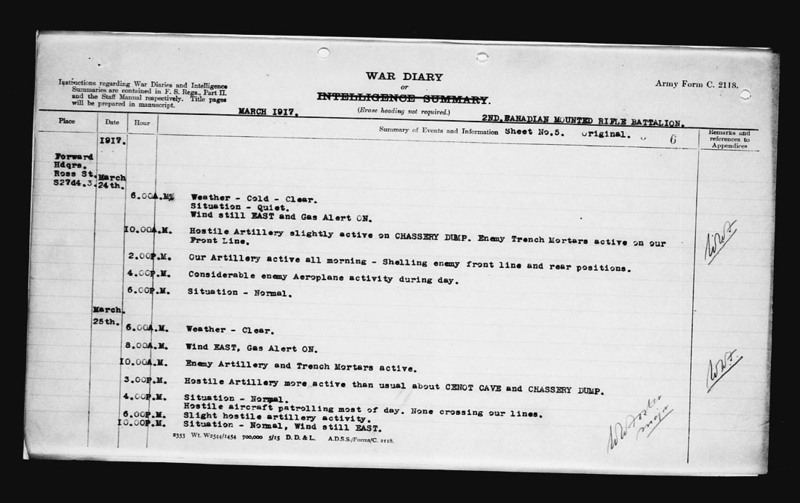 These were fired at 3 A.M. and an Artillery shoot on Enemy Front Line system was carried out from 3.13 to 3.30 A.M.
Battalion Rifle Grenadiers bombed Enemy Saps with good results.The above operation being in the nature of a feint raid it is presumed that enemy manned their trenches and thereby suffered considerable casualties. Wed., Mar 28, 1917 Forward Hdqrs. Ross St. S27d4.3. 6.00A.M. Weather – Dull, Cloudy. 10.00A.M. Our Artillery active, shooting up selected targets. 2.00P.M. Slight Artillery activity by enemy. 8.00P.M Lieut. T.D. 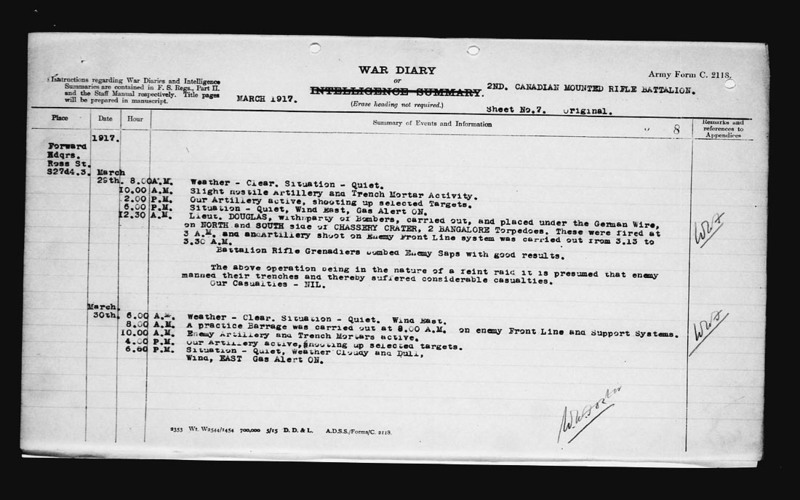 Brown and party broke through lip of CHASSERY CRATER and established an Observation Post, putting in a Snipers Plate. 10.00 P.M. Weather – Dull, Situation – Quiet. 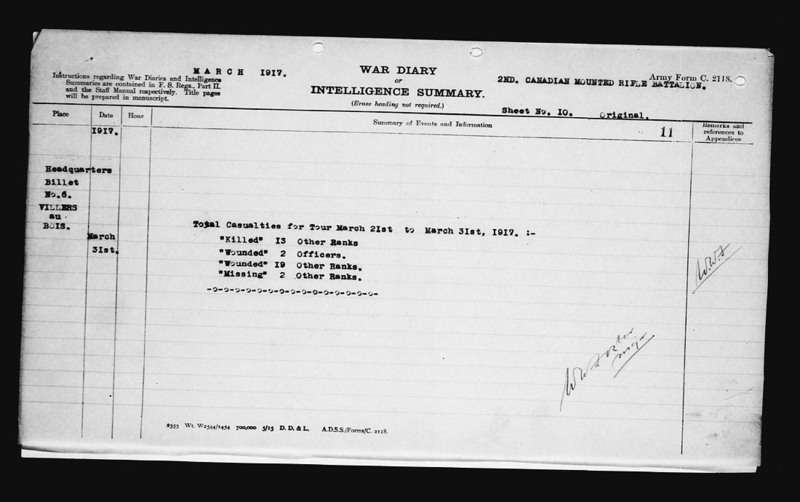 Tue., Mar 27, 1917 Forward Hdqrs. Ross St. S27d4.3. 5.00P.M. “D” Company relieved “B” Company in Front Line. 6.00P.M Relief completed no casualties. 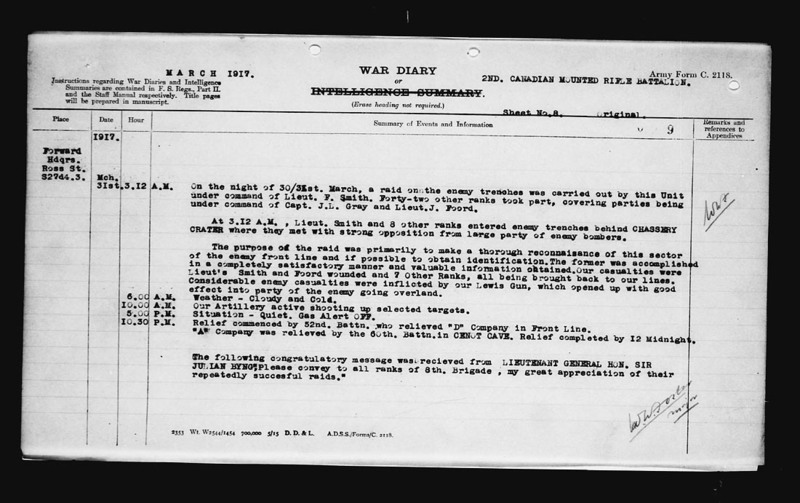 “B” Company proceeded to VILLERS au BOIS on being relieved, arriving about 11.00 P.M.
10.00P.M. “A” Company relieved “D” Company on CENOT CAVE. Relief completed at 10.30 P.M. No casualties. Weather – Cold, Raining. Wind East. Gas Alert ON. Mon., Mar 26, 1917 Forward Hdqrs. Ross St. S27d4.3. 10 A.M. Wind – East. Gas Alert ON. 2.00P.M. Slight hostile Artillery and Trench Mortar activity. 6.00P.M Working part of 50 men detailed for Trench Repair. 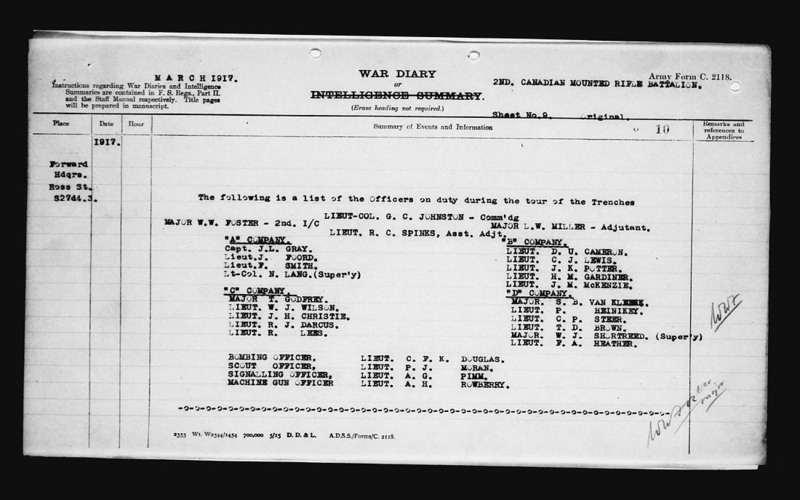 Sun., Mar 25, 1917 Forward Hdqrs. Ross St. S27d4.3. 8.00A.M. Wind EAST, Gas Alert ON. 3.00P.M. Hostile Artillery more active than usual about CENOT CAVE and CHASSERY DUMP. Hostile aircraft patrolling most of day. None crossing our lines. 6.00P.M Slight hostile artillery activity. 10.00P.M. Situation – Normal, Wind still EAST. Sat., Mar 24, 1917 Forward Hdqrs. Ross St. S27d4.3. 6.00A.M. Weather – Cold – Clear. Wind still EAST and Gas Alert ON. 10.00A.M. Hostile Artillery slightly active on CHASSERY DUMP. Enemy Trench Mortars active on our Front Line. 2.00P.M. Our Artillery active all morning – Shelling enemy front line and rear positions. 4.00P.M. Considerable enemy Aeroplane activity during day.